Last month’s midterm election drew the highest turnout in Michigan in nearly 60 years, and MEA members helped bring change across the state—volunteering for local and state candidates, making phone calls, writing postcards, knocking doors and donating to MEA-PAC, MEA President Paula Herbart said. 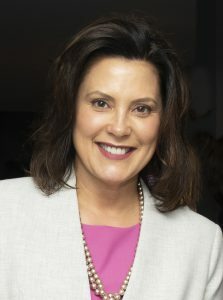 Wins for a slew of MEA-recommended candidates, highlighted by Gretchen Whitmer’s victory as governor, represent a “course correction” for Michigan and public education, Herbart said. Five MEA members won election to state-level office on the heels of the nationwide #RedForEd movement, including two in northwestern Wayne County who flipped seats from red to blue in tightly contested races: New Haven teacher Dayna Polehanki won Senate District 7, and Airport teacher Matt Koleszar will represent House District 20. MEA member Nate Shannon, a L’Anse Creuse economics and history teacher, won a 54-46 victory in a swing district. With his message of fixing the broken school funding system, Shannon found bipartisan support that was key to his victory. MEA-Retired member Sheryl Kennedy, a principal in Walled Lake, won her House District 48 seat by 10 points after vanquishing two opponents in the primary with 73 percent of the vote. All of MEA’s recommended candidates won races for governing boards at University of Michigan, Michigan State University, and Wayne State University. Wins for MEA-recommended candidates for the state Board of Education changed the party split from 4-4 to 6-2.